“Imagination is more important than knowledge,” Albert Einstein once observed, “for knowledge is limited to all we now know and understand, while imagination embraces the entire world, and all there ever will be to know and understand.” The tension between imagination and knowledge is palpable in Mr. Meebles (public library), a delightful and conceptually ingenious children’s book written and illustrated by Jack Kent. 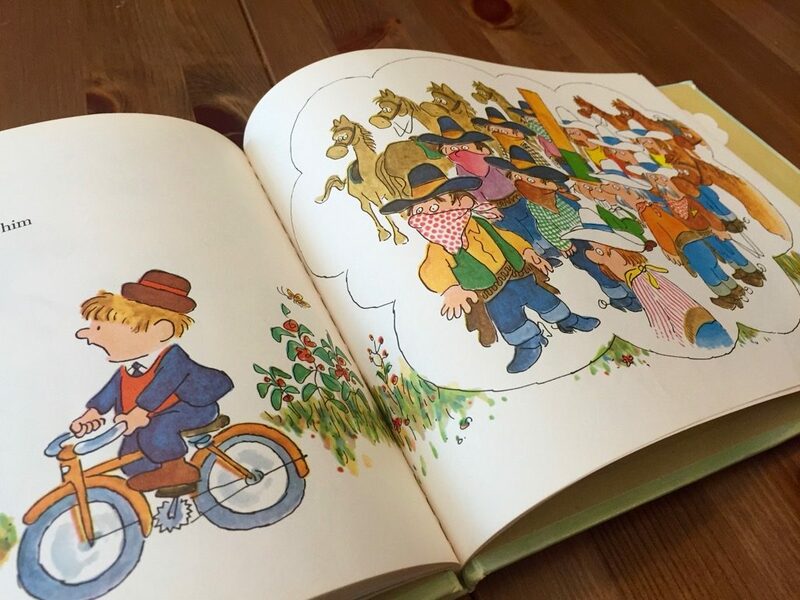 The book chiefly concerns imaginary friends, an age-old phenomenon in which children create friendships with companions that exist only in their imaginations. According to Dr. Larry Kutner, a psychologist who served nearly 20 years on the faculty at Harvard Medical School, 65 percent of children have imaginary friends. Dr. Kutner says that parents shouldn’t be alarmed by the fact that their children have imaginary friends. Imaginary companions are an integral part of many children’s lives. They provide comfort in times of stress, companionship when they’re lonely, someone to boss around when they feel powerless, and someone to blame for the broken lamp in the living room. Most important, an imaginary companion is a tool young children use to help them make sense of the adult world. Mr. Meebles acknowledges imaginary friends and provides validation to young readers who have experienced the phenomenon themselves, all while delicately suggesting that imaginary friends might someday be forgotten. The hero of the story is Donald, a boy who has an imaginary friend named Mr. Meebles. Donald and Mr. Meebles have lots of adventures when Donald has time to daydream, but from the start Mr. Meebles expresses concern over the fact that he’s only make-believe. Mr. Meebles was a very short man with a very tall hat and a very big problem. Mr. Meebles’ problem was that he was only make-believe. A little boy named Donald had imagined him one day when he didn’t have anything else to do. 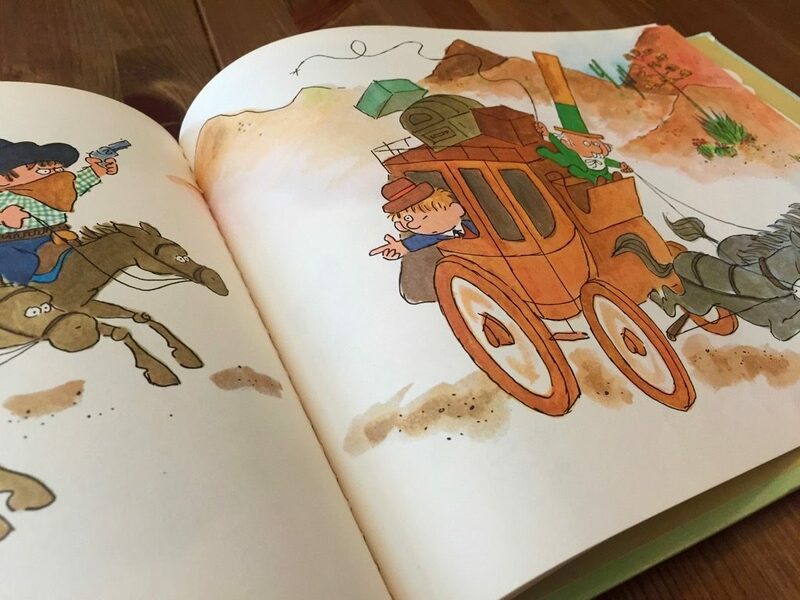 Together, Donald and Mr. Meeble tackle the stuff daydreams are made of: things like dragons, pirates, and outlaws. But one day a profound thought occurs to Donald’s imaginary friend: What happens when Donald doesn’t think about him? As Donald grows increasingly preoccupied with school and chores, he has less and less time for daydreaming. Mr. Meebles expresses concern at this and asks about what would happen to him if Donald never thought about him. ‘But I DO think about you,’ said Donald. ‘Not as much as you used to,’ said Mr. Meebles. This was true. Donald was going to school now. He didn’t have much time for make-believe anymore. Donald assures Mr. Meebles that he won’t forget about him. He comes up with an ingenious plan for remembering his imaginary friend day and after day. 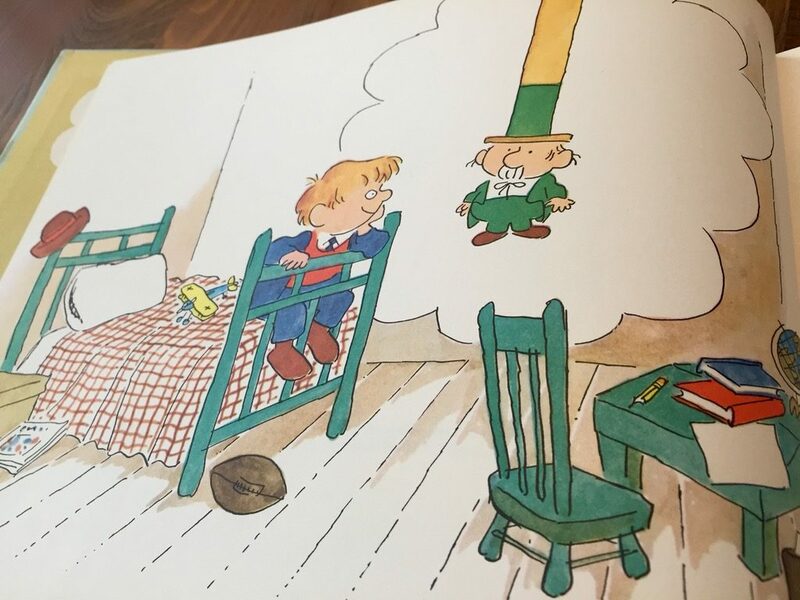 ‘I promise to think about you often, Mr. Meebles,’ said Donald. ‘I’ll write a note so I won’t forget. Whenever I have an idea I want to remember, I write it down,’ he said. 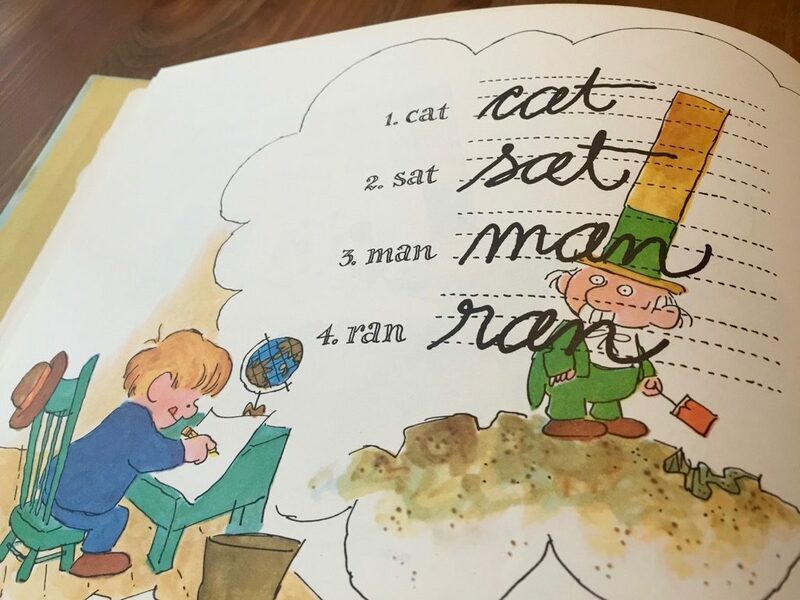 This reminded Donald that he had some spelling homework to do. Things don’t go quite according to plan, however, and Mr. Meebles has to take things into his own hands. The surprise ending will delight readers. The book’s gentle approach is perfect for parents of children with imaginary friends. According to Dr. Kutner, children already know that their imaginary friends aren’t real, and parents shouldn’t push their children too hard in either direction. Don’t insist that your child admit that his imaginary companion doesn’t really exist. Rest assured that he knows that. In fact, if you push your child too hard in the other direction, treating his invisible friend as if you truly believed he did exist, your child will probably become upset, and perhaps a bit frightened. 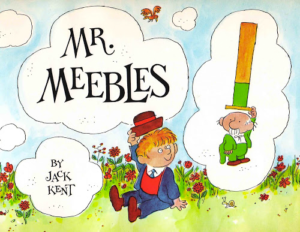 Mr. Meebles is out of print, but parents lucky enough to find this book used will be in for a treat. Children won’t soon forget this touching story of an imaginary friend whose biggest worry is about being forgotten. Complement it with Gila Monsters Meet You at the Airport, a wonderful children’s book about dealing with changes and stereotypes.